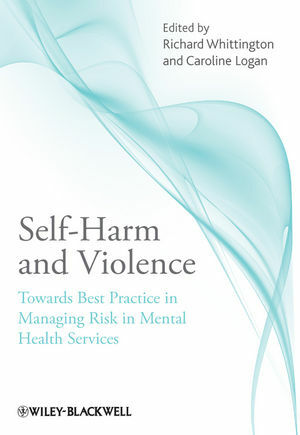 Self-Harm and Violence: Towards Best Practice in Managing Risk in Mental Health Services presents the first exploration of the most effective clinical practice techniques relating to the management of risk in mental health care settings. Richard Whittington is Professor of Mental Health in the School of Health Sciences at the University of Liverpool and an Honorary Research Fellow at Mersey Care NHS Trust. He has a PhD from the Institute of Psychiatry in London, and is a researcher and forensic psychologist with a particular research interest in the issues of violence, self-harm and mental health. Caroline Logan is a Consultant Forensic Clinical Psychologist in Greater Manchester West Mental Health NHS Foundation Trust and an Honorary Research Fellow at the University of Manchester. She has a DPhil from the University of Oxford and is both practitioner and researcher, focusing on violence and self-harm, personality disorder and risk. 1 Introduction (Richard Whittington and Caroline Logan). 2 Service Users: Experiences of Risk and RiskManagement (Kay Sheldon). 3 Carers: Experiences of Risk and RiskManagement (Sally Luxton). 4 Understanding andManaging Self-HarminMental Health Services (Maria Leitner and Wally Barr). 5 Understanding andManaging Violence inMental Health Services (Richard Whittington, James McGuire, Tilman Steinert and Beverley Quinn). 6 Suicide and Homicide by People withMental Illness: A National Overview (Kirsten Windfuhr and Nicola Swinson). 7 Evidence and Principles for Service User Involvement in RiskManagement (Helen Gilburt). 8 Guidelines and Standards forManaging Risk inMental Health Services (Caroline Logan, Norbert Nedopil and Thomas Wolf). 9 Organizations, Corporate Governance and RiskManagement (Ben Thomas). 10 Formulation in Clinical Risk Assessment andManagement (Caroline Logan, Rajan Nathan and Andrew Brown). 11 Evidence and Principles for Positive RiskManagement (Paul Clifford). 12 Encouraging Positive RiskManagement: Supporting Decisions by People with Learning Disabilities Using a Human Rights-Based Approach (Richard Whitehead, Ged Carney and Beth Greenhill). 13 Case Study 1: A Four-StepModel of Implementation (Geraldine Strathdee, Phil Garnham, Jane Moore and Devendra Hansjee). 14 Case Study 2: Narrowing the Gap between Policy and Practice (Kate Hunt). 15 Case Study 3: Learning fromExperience – Using Clinical Risk Data to Influence and Shape Clinical Services (Louise Fountain and Patrick McKee). 16 Case Study 4: FromTicking Boxes to Effective RiskManagement (Lorna Jellicoe-Jones, Mark Love, Roy Butterworth and Claire Riding). 17 Conclusions (Caroline Logan and Richard Whittington).